CKAN is a powerful data management system that makes data accessible – by providing tools to streamline publishing, sharing, finding and using data. CKAN is aimed at data publishers wanting to make their data open and available. Many open (government) data platforms rely on CKAN and while the web interface is pretty good, there’s still the hassle of finding and downloading the data using a web browser. For the full usage guide, visit the plugin’s Github page. It’s great to see how well CKAN and QGIS can play together to enable seamless access to open data! 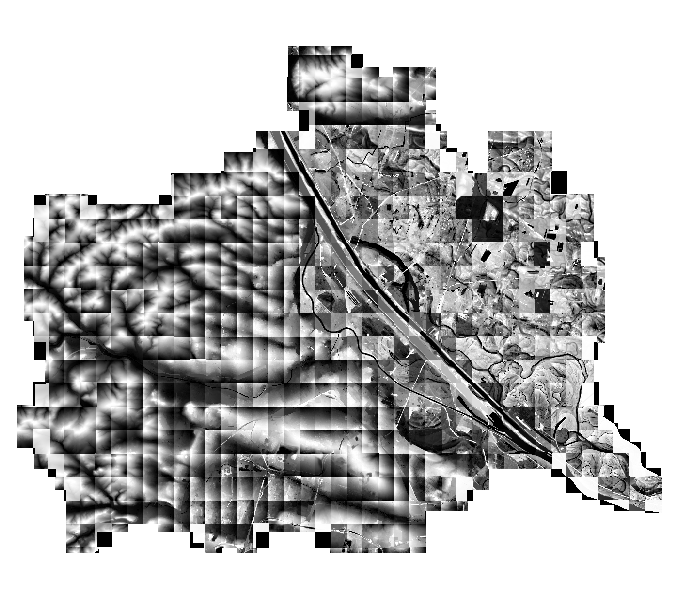 A while ago I wrote about the 5 meter elevation model of the city of Vienna. In the meantime the 5 meter model has been replaced by a 10 meter version. For future reference, I’ve therefore published the 5 meter version on opendataportal.at. A. Graser, J. Asamer, M. Dragaschnig: “How to Reduce Range Anxiety? The Impact of Digital Elevation Model Quality on Energy Estimates for Electric Vehicles” (2014). 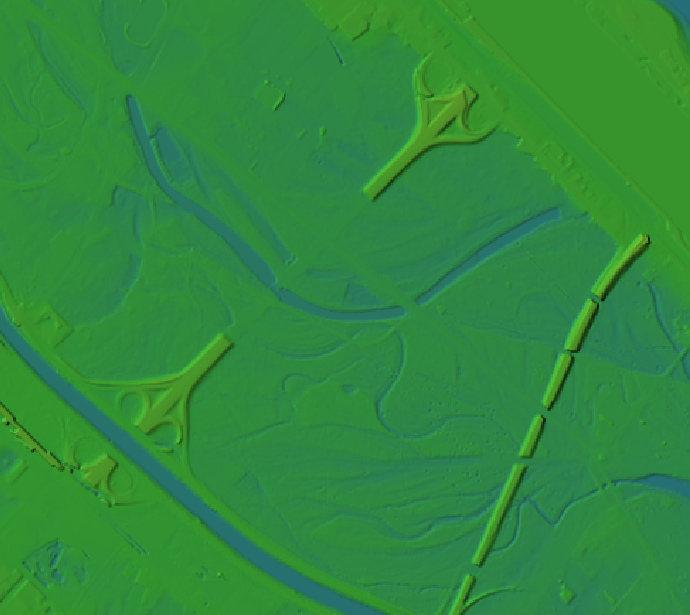 I hope someone else will find it useful as well because assembling the whole elevation model was quite a challenge. DataCatalogs.org aims to be the most comprehensive list of open data catalogs in the world. [...] The alpha version of DataCatalogs.org was launched at OKCon 2011 in Berlin. Vienna’s Open Government Data initiative is publishing an increasing amount of Geodata and the best thing is: They’re publishing it via open standardized services! Both WMS and WFS are available and ready to be used in QGIS. Let’s see how we can use the data available through their WFS using the district information layer “Bezirksgrenzen” as an example. The page lists a GML and a GeoJSON version of WFS. For now, we’ll use GeoJSON. 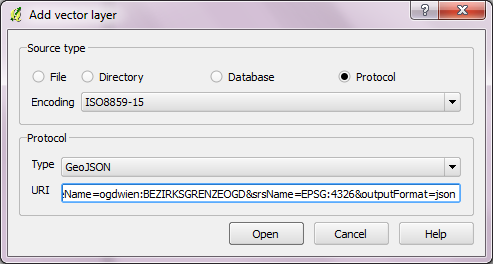 In QGIS, the layer can be loaded using “Add vector layer” – “Protocol” and inserting the GeoJSON url there. The encoding should be changed to ISO8859-15 to account for “Umlaute”. The loaded GeoJSON layer "Bezirksgrenzen"
Now, we have geodata. Let’s add some attribute data too! Attribute data is available in CSV format. After downloading e.g. some information on the district population, check the file content and remove excessive header lines so that there is only one header line containing attribute names left. 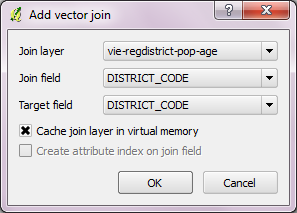 Then, you can load the CSV file into QGIS too (“Add vector layer”). Now, the attribute table of the vector layer contains the additional CSV attributes – ready for further analysis. If you want to classify based on numerical CSV attributes, you’ll have to create a .csvt file first otherwise all fields are interpreted as texts. Works great. Thumbs up for this great initiative! The city of Vienna has started their open data initiative. They’re offering data on a variety of topics, including: infrastructure, population, education, environment and traffic. Both WMS and WFS work well with the developer version of QGIS. Looking forward to new datasets. Announcements should be published via RSS feed.